Dili, Timor Leste – Education is a compulsory element that has to be done by everyone anywhere in the world. Indonesia, as one of the largest countries in the world, has the responsibility to build human resource capacity. Not only has Indonesia done it for its own people, but also it has endeavored to inform transparency in pursuing education to the people in other countries, including Timor Leste. In order to support capacity building in the country’s education as well as to cooperate with Timor Leste in the same sector, the Government of the Republic of Indonesia through the Embassy of the Republic of Indonesia (KBRI) for Timor Leste has worked together with the Government of Timor Leste by holding Indonesia EducationFair 2018 which was organized at Indonesia Culture Center Building in Dili, Timor Leste. The event started from July 25, 2018 and it was closes on July 28, 2018 by presenting various activities, such as Education Fair, Seminars, Festival of Indonesian Culture. A number of universities consisting of 17 Universities from Indonesia, including Indonesia Open University or Universitas Terbuka and 9 Universities from Timor Leste participated in the exhibition and shared their information regarding the educational services in each of the universities to the prospective students coming from various regions throughout Timor Leste. The presence of Universitas Terbuka (UT) in Timor Leste is a challenge and, at the same time, a response that UT has been able to hold its education programs overseas. With a distance learning education which is supported by good facility, UT has been well received by the people of Timor Leste. The visitors showed a great amount of enthusiasm while UT Booth; a wide range of questions and education needs were raised in order to get information regarding the Indonesia Open University. In addition, UT had also the opportunity to get in touch with Indonesians living in Timor Leste and the people of Timor Leste in Dialogue on Educational Profile. Represented by Head of Overseas Student Service – UT, Dewi A. Padmo, Ph.D, who shared the information about UT; she explained that UT has more strength advantages compare to other universities with its distance learning education system. Moreover, according to her, UT’s presence in other country may help the people living abroad to enjoy the education that it offers. 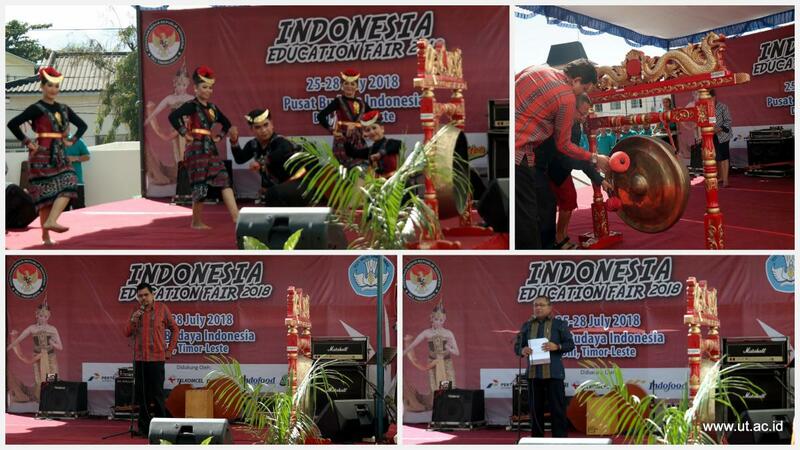 The Indonesia Education Fair 2018 even was officially opened by the Ambassador of the Republic of Indonesia for Timor Leste, Sahat Sitorus, and in his opening speech he expressed appreciation to the universities and other institutions which came long way from Indonesia to Dili, Timor Leste in order to share their educational information. He said that this activity is a good opportunity for Indonesian universities which are among the best choices for the people of Timor Leste and it is expected that this education fair would be able to improve the visitors’ viewpoints in order to gain access to and information on education, as well as, most importantly, to maintain the good relationship of the two countries. During the course of the activity, the program was remarkably interesting as it was entertained by musicians as well as cultural and art performance by both countries.